This report outlines some of the basic differences between the most popular cleaning methods available as well as their individual strengths and weaknesses, so that you can make an informed, intelligent decision, rather than crossing your fingers and hoping for the best! Remember that each method must in some way employ both “soil suspension” and “soil extraction”. In other words, getting the soil to release from the carpets, and then employing some method of extracting the soil from the carpetand depositing it into a waste tank. 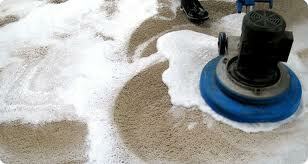 This is a relatively new, innovative method best suited to interim cleaning on low pile, commercial grade carpet. This technology uses a special polymer or crystal that literally encapsulates soil particles on contact. A solution is misted onto the carpet, and a special machine is used to agitate the solution into the fibers. As the solution dries, it forms a crystal that encapsulates the soil particles, which are then removed through routine vacuuming. This product can continue to work for several vacuumings, thus encapsulating and removing even soil that has been introduced to the carpet weeks after the initial cleaning. This is why it works well for commercial applications where a regular, thorough vacuuming is done. Hot water extraction cleaning is by far the most effective and widely recommended method in the industry. With HWE, a thorough pre-vacuuming removes all the dry particulate soils from the carpet. A cleaning solution is then sprayed onto the carpet to break down the oils and greases. In some cases, the conditioner is agitated with a grooming rake or rotary brush machine to further enhance the cleaning ability. The soil and solution is then thoroughly rinsed from the carpet by combining a pressurized hot water rinse with a powerful wet vacuum. Most professionals use a truck mounted unit, which uses long solution and vacuum hoses to reach the carpet. The dirty water is deposited in a waste tank located on the truck. There are also “portable” extractors as well as residential “steam cleaners”. These operate on the same principles, but with reduced heat, water pressure, vacuum, and inferior cleaning solutions, they are usually not nearly as effective as truck mounts, and usually result in higher dry times. After the carpet has been rinse extracted, it is recommended that a quality carpet protector be re-applied to the carpet to replace the factory protector which most likely has worn off. Pros: Required by most carpet manufacturer warranties, recommended by the IICRC, highly effective cleaning capability, strong rinsing phase removes imbedded soils as well as any cleaning solution residues for a true “deep clean”, the “tried and true” cleaning method of the industry. Beautiful Carpets and Floors uses truck mounted Hot Water Extraction to clean your carpet for maximum soil removal and longer carpet life span. For commercial applications, we also have the ability to utilize encapsulation cleaning to provide a cleaning maintenance program that fits your needs and your budget. Call today for a free inspection and price quote!